Therein lies the problem. Seems few people actually turn the packages over and read it. I am sure that since ABC7’s Roberta Baskin investigation into organic foods that are, in spite of what the retailer promotes, imported from China (where there is no Department of Agriculture keeping tabs on it), Whole Foods scrambled to find a plausible explanation – which, by the way, I can’t imagine what that would be because, well… a lie is a lie, right? In one video, Whole Foods wouldn’t allow cameras into the store, so the ABC7 I-Team reporter actually bought some of the items and approached shoppers outside the store for comments. “Honestly, I would have never flipped it over to see that it was a product of China,” one shopper told the news outlet. So now the question becomes: Where does California come in again? As the news report explains, organic ensures pesticide free and environmentally-friendly conditions. But I just read a report that quotes a study stating the air quality (an environmental condition) in China causes the death of approximately 4,400 people EACH DAY. “The oversight that they have in China is not the same type of supervision that we have in the United States,” says one unidentified person when questioned about the legitimacy of the food being organic; especially since there is no watchdog organization such as the USDA in China. “So how would they ever know if the organic rules are being followed” is a question Linda Greer, a senior scientist at the Natural Resource Defense Council, who has actually visited farms in China asks. “I wouldn’t buy something organic from China [with the] idea that it was truly organic,” she concludes. Now think about it people. Historically, anything we have seen or purchased that was made in China was more often than not: cheap. We’re talking China — where mass production is key. This is not Japan, where quality really matters. The questionable quality of China’s produce has, this year alone (and we’re only two months in as of this writing), had the Food and Drug Administration — which checks for safety of foods — place a halt on 260 shipments of foods like strawberries that were “contaminated with bad pesticides, bacteria or filth,” according to the I-Team report. The video below is not new, but it shows how stores have been pulling so-called “organic” products off the shelves with a quickness! Unless we consider taking a lesson in how to successfully grow our own food, we had better start doing some deep research to see if our “organic” food is really organic. Organics cannot advertise pesticide free, because it is not. Same with advertising organic food as more nutritious, because it is not. They can say “sustainable” but what is so sustainable about yielding 1/2 the food per acre compared to “conventional”? And, by the way, there is nothing wrong with conventional, which typically has a much smaller carbon footprint than organic farming. Norman Bourlaug and Monsanto have saved millions upon millions of lives while Whole Foods strives to sell overpriced lies (like implying organic food is more healthy when it is not). 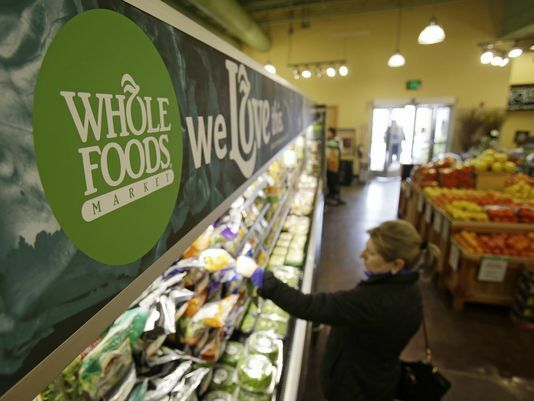 Here’s the facts, Jack: Whole Foods is bigger than Monsanto. Big Organic. The biggest scam ever perpetrated in the history of the planet. If you buy organic products, you are just paying a stupidity tax. How do I know? I run a certified organic facility, and I can tell you that all you have to do is gather a thick stack of bulls**t paperwork and then hand over a thick stack of paper with dead presidents printed on them to the inspection company. The audits are so full of holes you could drive a truck through them. Is anyone testing product in the field for non-allowed pesticides (though it does not matter, as all pesticides are safe at the levels used, not just the “natural” ones approved for organics). Yeah, about 1%. Why would the inspection company want to waste it’s profits sending things to labs to have them tested? This is all about lies, and scamming customers by implying that organic is pesticide free, more nutritious and sustainable, and GMO’s and conventional agriculture is spooky and dangerous. But conventional is not dangerous. And organic uses plenty of poisons and produces less per acre. We now live in the most food secure world in the history of humanity, and it’s because of technology, not backward looking Luddites that are rich enough to choose to not eat something because it is “conventional” and not bought at Whole Foods. Save your money. Buy conventional. Go ask a real farmer, not some dreadlocked employee at the local Natural Food Store. Farmers know the score (I have been a farmer for 9 years now). Stupidity Tax. Remember that the next time you are paying a 50% surcharge for a load of horse apples. I always felt that the term “Organic” which at a time where people would wake up at the crack of dawn go outside to pick fresh vegetables, fruits, and meats from outside of their home to cook food for the family for that day. The question now is Whole foods milk ? even consider organic or the flat lie of label on the product lures people into believing that their products are fresh. Bamboozle 101 = ignorance at its finest. Tretinoin cream has become one of the most demanded skin care items for many years because of its effectiveness in treating acne and also photaging. end result after lasting usage. Would like to know even more regarding this product?